Liquid pen, powder, or pencil? We'll help you choose! You know how you choose a moisturizer that suits your skin type? When it comes to grooming your arches, it’s the same thing! You have to find the best product (or mix of products) that can help you define your brows perfectly (think: Audrey Hepburn and Cara Delevingne). Bookmark this checklist, so you know what to buy the next time you go beauty shopping. Soften your features by going for a powder formula (or matte brown shadow) that can fill in the few sparse spots that you have. Just use a stiff, angled brow brush to trace and outline your arches. Try Prestige Brow Shaping Studio, P550. Your best bet will be to use a pencil with a thin tip for more precision. 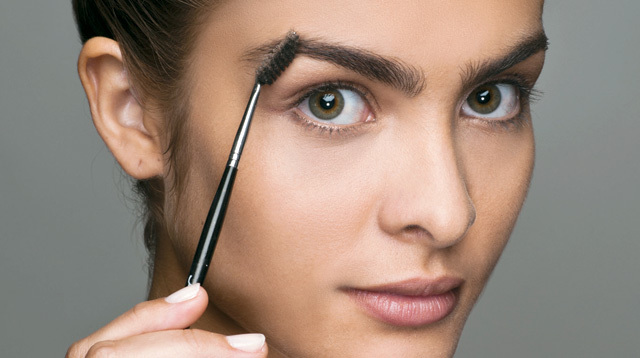 Tip: Just make sure you use short strokes and brush it out with a spoolie (clean mascara brush) to make them appear more natural. We’re liking MAC Eye Brows in Brunette, P900. We feel your pain, but you’re gonna have to exert a little more effort when it comes to drawing on brows. Master using a liquid pen and using light, feathery strokes to mimic the look of real hair strands. Try K-Palette Lasting 2Way Eyebrow, P950. Its long-lasting, water-resistant formula will ensure you have brows until the end of the work day, and it comes with a powder that you can pat over your eyebrows to create a 3D effect. The beauty rule for brunettes is that your brows have to be a shade or two lighter than your hair color (for blondes, it’s darker). So that you don’t have to resort to bleaching every two weeks, just brush on colored brow mascara after you fill in the sparse spots. Try Etude House Color My Brows, P378. Reach for some colorless brow wax to flatten and tame strands that refuse to stay in place. To use, dip an angled brow brush in the wax and groom in an upward motion until you score the shape you want. A cult fave: Smashbox Brow Tech Wax, P950.